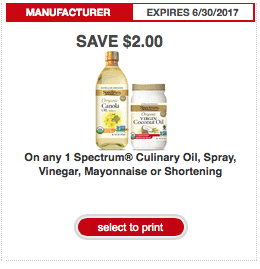 Here’s a rare new $2 off any Spectrum culinary oil, spray, vinegar, mayo or shortening coupon! You can print two copies. It’s found on Target’s site, but it prints as a manufacturer coupon, so you can use it at any store that accepts coupons. You may also be able to find this coupon on Coupons.com, depending on your zip code. Whole Foods has Spectrum mayo starting at $4.99, so just $2.99 after coupon!